It’s no secret that I’ve always been a huge fan of this larger than life Jewish executive, Mr. Howard Schultz. Super-successful, yet so down to earth. At the end of 2012, while so many people were freaking out about his Come Together campaign, I had only praise for this audacious Jewish business leader who was constantly coming up with solutions to society’s most crucial problem — the divisiveness between people. There have been many similar campaigns since. Yet before we can truly fix the growing division in society — we need to understand what we are dealing with — the growing human ego. We need to apply a specific method that enables humans to come together above the ego, to connect above our differences at a higher level of consciousness. At this level we are more in sync with the harmonious system of nature that we exist in. Understanding the benefits of our interdependence is the next stage in our evolution, and it is up to the Jews to provide this method to the world. The cause for the division in society is that we are only activating the negative forces in nature. It is up to the Jews to teach the world how to activate the positive forces in nature, so we can bring our world back into balance. At the moment, nature is winning, and we will continue to see this trend of extreme weather disasters until we begin this educational process. We treat the world like a big garbage can and wonder why all our systems are no longer functioning. The only part of the universe that is causing harm to the general system, is the human part, which is out of sync with the other elements. “There is a worldwide desire for truth, civility, for decency …. The world is hungry for the idealism of America. Decades of therapy, self-help, and more recently, yoga and mindfulness, cannot solve these issues because they are focused on the empowerment of the self. We are at a critical point in our human evolution where we must focus on the matter between humans. We need to shift the energy between us from negative to positive, and this is where Israel comes into the picture. Over the years I tried to convey how Starbucks can lead this vital change by reaching out to top Starbucks executives such as the Chief Sustainability Officer, the Head of Public Affairs, and executives who work directly with Howard Schultz. I sent detailed guidelines about how Starbucks can leverage its physical stores to generate the much need positive shift in society, and received brief thank you emails directly from the top of the Starbucks empire. That document is from 2011, but today there are so many ways we can leverage technology to accelerate this necessary shift. I’m a highly experienced and accomplished global business executive, but have felt a higher calling for many years now. I am extremely passionate about bringing about a major positive shift in the world, and I truly believe we can elevate society by promoting better values. What would I like to do in the next stage of my life? I would like to restore dignity to millions of Americans who have been cut off from society, and I would also like to restore the dignity of America as a country that other countries use, as a model to shape their own societies. I view solving these issues as my vocation in life, and will do everything in my power to restore good human values at all levels of society. “ … stay true to our reason for being: inspiring and nurturing the human spirit through a sense of community and human connection. Amid the chaos, try to listen with empathy, respond with kindness, and do your best to perform through the lens of humanity. Now more than ever the world needs places to come together with compassion and with love. Providing the world with a warm and welcoming third place may just be our most important role and responsibility, today and always. 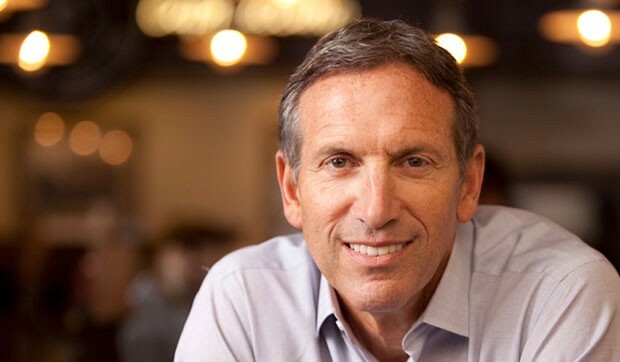 As a leader of a major corporation with physical stores all over the world, I believe people like Mr. Schultz have far more power than any sitting president. Unlike fast food chains such as McDonalds that are 100% profit-driven, Starbucks has always been focused on how to be a contributing element in society. Starbucks has everything in place to bring about a major shift in the entire world through its physical stores, and this process can begin in the new store in Milan. Jesse Bogner is a millennial author from a wealthy background, who moved from New York to Israel after discovering a better way to exist. Like many people his age, he was on the path of self-destruction and his family had completely lost hope. All that shifted the day his father, Seth Bogner, asked him to go over some text for a book by Michael Laitman (the world’s foremost Kabbalist). Jesse became immersed in the texts over the next few months, and at an event in New Jersey, Michael Laitman asked Jesse to come to Israel to write about his experiences. Jesse decided right there and then to leave his hedonistic life behind and study Kabbalah in Israel. Right around the same time that Jesse moved to Israel, his family moved to Florence, Italy. The connection method from Israel is based on the authentic wisdom of Kabbalah, which is a spiritual method of advancement. (Not to be confused with the American, profit-driven version of Kabbalah.) But this does not mean that millions of people need to sit and start studying Kabbalah. Not at all. The masses simply need to get the education about what to do with all this excess energy of the human ego we have today. And it’s not like we need to run out to the fields for our food anymore where we could work off some of that steam. Soon, only a small percentage of people will work, and the rest of us simply need to learn about our true vocation — the real reason we were put here. To function as a harmonious unit just like nature. How can we bring this about? The Connection Method is based on a simple workshop where participants answer a series of questions, while following the workshop rules. The rules include only speaking when holding the speaking object, trying not to judge others when they are speaking, and to speak briefly when it’s your turn to answer the question. Participants come away with an incredible feeling of exhilaration, because the circle works in a complete opposite way to our competitive society. How will I have the strength to continue to want to do good for others? Mr. Schultz, you have created an incredible Starbucks in Milan, but the greatest present you can give the Italian people is the method of connection. The greatest gift you can give to any group of people in the world today, is the method of connection that the world really needs right now. Business can continue as normal, and the only thing that needs to change is to add this human bonding activity in any public place where people come together. We can use all these opportunities to generate positive energy in the world, but this doesn’t come naturally to us. These new feelings must be nurtured in a systematic way, and for that we need a very supportive environment. Ideally, Starbucks would use every means available to constantly expose people to new values that encourage us to get along better. This is why the Come Together campaign was so brilliant, but it must come with the necessary training and/or education. At the moment, companies like Starbucks only make corporate decisions to train employees about such matters when there is a crisis. But actually, all of humanity must undergo this education about how to get along here together in a sustainable manner. The holiday of Sukkot represents an essential change of values. By changing our values — from individualistic and egoistic to connective and altruistic — we will be able to create a safe, harmonious and happy world. The desire to benefit others is called “waste” because we instinctively perceive caring about others as completely unnecessary. That is, our personal concerns — ”What will I eat?” “Who will be my partner?” “What will happen to my family?” “How can I make my money and living?” “How can I earn other people’s respect and appreciation?” “How can I achieve my life’s goals?” “How can I meet all my needs?” — easily bury any thought or concern we have to benefit other people. The construction of the Sukkah symbolizes raising importance of this “waste” — the desire to benefit others — above all of our desires to personally benefit. Therefore, Sukkot is a holiday celebrating the overcoming of positive human connection above our egoistic, materialistic approaches to life.